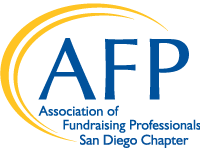 The purpose of AFP San Diego Young Professionals is to provide educational and networking opportunities for junior-level members of the local nonprofit community to help them advance in their profession, serve as resources for each other to ensure the highest level of ethical practice, and contribute to the advancement of San Diego’s nonprofit and philanthropic communities. This group is for young professionals who are committed to advancing the profession of development through networking and education, and demonstrating a strong, positive commitment to the philanthropic community. Membership is open to professionals who have up to four years of experience in the fundraising profession and are looking to grow. All ages are welcome. There is no cost to be associated with this group, and it is not limited to AFP members. Non-members can attend Chapter monthly luncheons and workshops at non-member price. Our goal is to provide networking opportunities for fundraising young professionals to learn together, make better decisions, have fun and influence philanthropy by understanding their role as having the power to make a difference. Our goal is to elevate the fundraising profession and public perception of young professionals as they become better leaders benefiting AFP and the philanthropic community. For more information, contact our Young Professionals Chair, Sarah Booher at sbooher@museumofman.org.